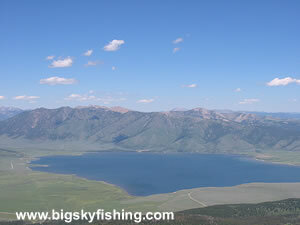 The Montana Scenic & Rural Drives section on Big Sky Fishing.Com profiles nearly 50 different drives in detail, and provides photographs, detailed descriptions and custom maps to help visitors locate a route they might enjoy on their next visit to Montana. The information in this section of the site is unlike anything you’ll find anywhere else, and makes for a wonderful resource that all visitors to Montana should take advantage of. However . . . there are far, far more than “50 scenic drives” in Montana. Truthfully, virtually any road (and that includes roads in Eastern Montana, too) can provide a beautiful and relaxing journey if the weather, season or light is “just right.” Even when sitting in a traffic jam in Kalispell on US 93, a visitor is rewarded with superb sights. Yet, US 93, like many other highways in Montana, didn’t make the “cut” for the scenic and rural drive section on Big Sky Fishing.Com. Other than beautiful scenery, by far the most important criteria for me in determining whether to list a scenic drive is the traffic. With a few exceptions, heavy road traffic led to many potential beautiful drives being excluded. Thus, US 93 (which provides spectacular views of the Bitterroot, Mission and Flathead Valleys) was excluded from this section, due to the horrible traffic usually encountered. I personally find heavy traffic a BIG detriment to enjoying a particular route, in Montana or elsewhere. So what are the exceptions? In order for a road that has heavy traffic to be included, the scenery truly has to be outstanding and unique. Only two drives met these criteria – the Going to the Sun Road and the Beartooth Highway. It seems common sense, but unless the views are good along a drive, I won’t be interested. Now, let me define good – good views means more than a “few peeks” of some scenic highlights while the remainder of the drive remains buried in a deep, thick forest. Instead, “good views” means that the drive offers sweeping vistas throughout most of the length of the drive. The types of views offered can range from the chalk cliffs of the Missouri Breaks to the towering peaks of the Rocky Mountains to everything in-between. Because of this, a few “scenic routes” that the State of Montana promotes are either not listed or are “glossed over” due to my lack of love for these particular routes. Thus, the remote drive down US 83 through Seeley Lake is missing from Big Sky Fishing and will never make an appearance, either! The paved roads in Montana really do cut through some beautiful country. 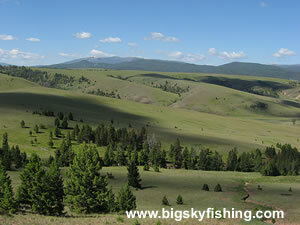 Yet it is the gravel roads that take the visitor to places that define what Montana is all about. Thankfully, there are MANY gravel roads in Montana that are, usually, in superb condition. These gravel roads can, except during snow events, rain or during the mud season, be easily driven in a passenger car. So what’s my point? Simple. Do NOT be put off on a scenic drive simply because it follows a gravel road. If the weather is good (and it usually is during the summer), many gravel roads in Montana are well worth taking. And if the cost is a few “dings” in the paint job of your car, well . . . buy some touch up paint when you get home! During all my travels while putting together this section of the site, I only ended up on ONE road that absolutely requires four-wheel drive – even during good weather. That road is the Missouri Breaks Backcountry Byway. All other roads can, during normal summer weather, be driven in a two-wheel drive vehicle, although a high-clearance vehicle often comes in very handy. Now, that said, many of the roads listed in this section are either closed during the winter months or turn nearly impassable during the mud season or heavy rain events. If you’ll be driving on a gravel road in a passenger car or mini-van or similar type vehicle, be sure the weather is cooperative. Remember, many of these roads are REALLY rural. If you get stuck, you might have a long wait for someone to come along. The odds are also quite good that your cell phone won’t work, either. In short, use common sense in determining whether to drive a road. But, as a general rule, all but one drive profiled in this section of Big Sky Fishing CAN be driven in a normal two-wheel drive vehicle during the summer months except during extreme weather events or during periods of heavy, long-lasting rain. Want More Information About Driving These Roads? If this will be your first time venturing off the pavement in Montana, it might be worth your time to read the page about What To Take and Prepare For when driving many Montana scenic drives. By and large, most of the information is common-sense stuff. But there’s also some information that people from out-of-state might also not be aware of.